WRAY, Colo. — Behind a tall curtain of corn that hides their real cash crop from prying eyes, the Stanley family is undertaking an audacious effort to expand their medical marijuana business to a national market. For years, the five Stanley brothers, who sell a nonintoxicating strain of cannabis that has gained national attention as a treatment for epilepsy, have grown medical marijuana in greenhouses, under tight state and federal regulations. 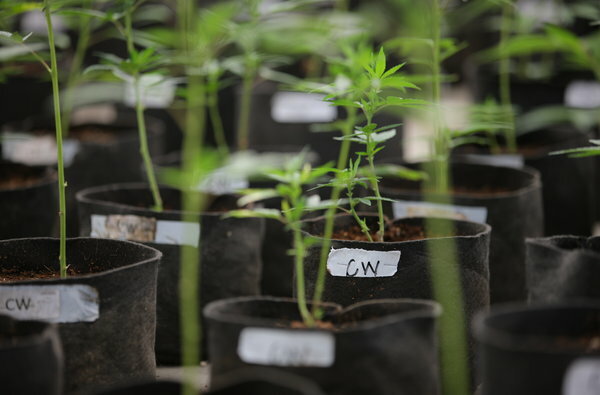 But this year, they are not only growing marijuana outdoors by the acre, they also plan to ship an oil extracted from their plants to other states. The plan would seem to defy a federal prohibition on the sale of marijuana products across state lines. But the Stanleys have justified it with a simple semantic swap: They now call their crop industrial hemp, based on its low levels of THC, the psychoactive ingredient in pot. “The jump to industrial hemp means we can serve thousands of people instead of hundreds,” said Jared Stanley, 27, who wore muddy Carhartts and a rainbow friendship bracelet as he knelt down to prune his plants. Colorado, which has legalized the sale of marijuana for recreational and medical use, has accepted the new designation. But the real question is whether the federal government will go along. If it does, the impact would be significant, opening the door to interstate sales not just by the Stanleys, but possibly by scores of other medical cannabis growers across the country. But if it does not, the Stanley brothers could be shut down by federal agents. So far, the Drug Enforcement Administration is offering few clues, insisting in public statements that while it is willing to allow marijuana sales in states that have legalized the drug, it might step in if growers try to sell beyond state borders. The Stanleys’ quest to ship their oil to other states highlights the fraught marijuana legal landscape where state and federal laws conflict and federal agencies can have divergent policies, leaving laws sometimes enforced, and sometimes not. The hazy legality of hemp can be seen in products like hemp granola and shampoo, which are allowed to fill health food store shelves even though they technically violate federal drug laws. All those products are made from imported hemp, which has generally been permitted into the country so long as it has less than 0.3 percent THC. If the Stanleys ship their oil, industry watchers say, it will be the first time in decades anyone has tried to sell domestic hemp nationwide. 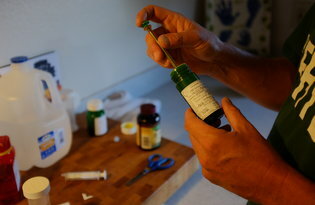 In recent years, hundreds of families with epileptic children have moved to Colorado to try oil made from the Stanleys’ shrubby strain, which they call Charlotte’s Web. The national Epilepsy Foundation has called for it to be available to all patients, though formal research into its effectiveness remains scant. There is a nationwide waiting list of more than 9,000, which the brothers hope to eliminate by expanding their crop from small greenhouses into vast hemp fields. The brothers, who had a Christian upbringing in conservative Colorado Springs, started a small medical marijuana business in 2008 after seeing the relief it brought to a relative sick with cancer. At first, they grew mostly marijuana high in THC that packed a serious psychoactive punch. On the side, they experimented with breeding plants low in THC but high in another cannabinoid known as cannabidiol, or CBD, which scientific studies suggested was a powerful anti-inflammatory that a handful of small studies showed might have potential as a treatment for certain neurological conditions, including seizures and Huntington’s disease. Then, in 2012, a Colorado mother named Paige Figi came seeking CBD-rich marijuana oil for her 5-year-old daughter Charlotte, who has a genetic disorder called Dravet syndrome, which caused hundreds of seizures per week. 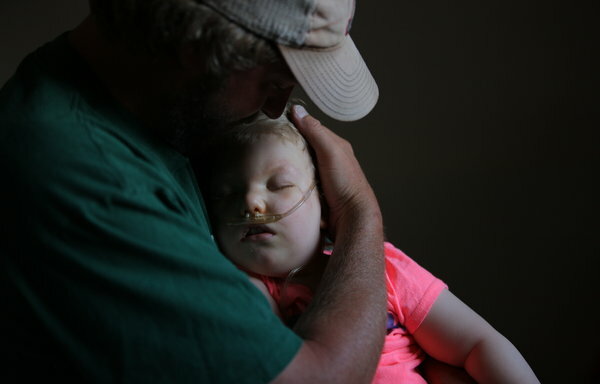 After a few doses of oil made from Hippie’s Disappointment, Charlotte’s seizures all but stopped, and two years later, daily drops of oil keep her nearly free of seizures, Ms. Figi says. The Stanleys renamed the plant Charlotte’s Web. Charlotte’s story spread, and patients began moving to Colorado. About 200 families now use the oil, and many have seen significant reductions in seizures, according to Dr. Margaret Gedde, a Colorado physician who recently conducted a small survey of the patients. Though few have seen their seizures totally disappear, nearly 80 percent told Dr. Gedde that the oil was more effective than traditional pharmaceuticals, with fewer side effects. Colorado medical marijuana law restricted production by requiring limited plant counts, locked greenhouses with security cameras and costly “seed to sale” tracking for every plant. The law also required every milligram of Charlotte’s Web to remain in Colorado. But last year, Colorado voters passed a law legalizing industrial hemp — defined as cannabis with less than 0.3 percent THC — allowing farmers to grow it with few restrictions. Charlotte’s Web falls well below that level, the Stanleys say. Recreational marijuana typically has THC levels around 15 percent. Because United States Customs and Border Protection has also used the 0.3 percent THC level for determining whether to allow imported hemp into the country, the Stanleys say they can legally ship their oil. But the D.E.A. maintains that the Controlled Substances Act holds that all cannabis, whether called marijuana or hemp, is illegal. People in the hemp industry say it is hard to foresee the agency’s response. The Bush administration cracked down on all hemp in 2003, saying whether soap, cereal, vegetable burgers or hemp cheese, any product with a trace of THC could be seized. A federal appeals court blocked the action in 2004 before it took effect. The Obama administration has generally deferred to states on the question of cannabis, allowing recreational marijuana in Colorado and Washington and medical use in 21 additional states, and in the District of Columbia, provided sales followed certain criteria. But in the last four months, the D.E.A. has seized thousands of pounds of nonintoxicating industrial hemp seeds, including a shipment bound for a research project at the University of Kentucky. Though the Stanleys maintain that shipping hemp oil is legal, they have hedged their bet by working with Representative Scott Perry, Republican of Pennsylvania, to introduce a bill in late July that would exempt Charlotte’s Web and other “therapeutic hemp” from the federal definition of marijuana under the Controlled Substances Act. Amid the uncertainty, the brothers are pressing forward. They have moved oil production from a commercial kitchen to a sterile lab staffed by scientists from the pharmaceutical industry. Having planted 17 acres of hemp in Colorado this year, they plan to plant 200 next year. They plan to start shipping their oil as soon as they fill their waiting list of orders in Colorado, which they expect to do this fall. They are also setting up a 1,000-acre hemp farm in Uruguay, which recently legalized both marijuana and hemp, to handle global sales. In five years, they hope to have 3,000 acres growing in different states and countries. Many of their workers are parents or siblings of children who rely on the oil. Penn Mattison, who moved to Colorado from Tennessee last winter to treat the seizures of his 2-year-old daughter, Millie, is one.